Using paper forms and manual keyboard data entry to collect operational data wastes a lot of people's valuable time and can result in many data collection and operational mistakes. These problems can be prevented though the use of a BellHawk barcode scanning and mobile data collection system. Data can be collected directly on the production floor or in the stock room or warehouse. 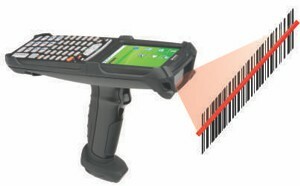 BellHawk barcode tracking systems are designed for use by material handlers, machine operators, and other production workers who may have limited computer literacy or for whom English is a second language. Data collection is point-and-shoot. There is nothing to write down, which is much quicker that writing down data on a paper form and/or manually keying it into a computer, often hours or days later. The labor cost savings from this alone can pay for the cost of implementing a barcode tracking system in under a year. Because the data is captured in real-time and immediately transferred to a central database, managers, supervisors, sales and customer support people and everyone else in the organization can immediately see the real-time status of customer orders, work orders, work-in-process, inventory, receipts and shipments. This is in contrast to many ERP systems where the data is at least a day old by the time that it is entered. This is fine for accounting purposes but not for real-time management of industrial operations. Users have immediate feedback when data is captured correctly. The scanner beeps when you have accurately captured and rejects all barcodes it cannot read. The barcode tracking software can then immediately validate that the correct data has been entered and warn the user if they have made a mistake. Even more importantly, a BellHawk barcode tracking system can validate that the user is not about to make an operational mistake, such as picking the wrong part for a customer order or using the wrong ingredient for a production batch. BellHawk also captures a permanent electronic record of what materials were used to make which products and who they were shipped to is immediately captured. This data can be used to rapidly produce reports that enable detection of the source of defects and the tracking down of all defective material that resulted from a specific defect or source of contamination.